Well I don’t know about anyone else, but I cannot wait until summer. Our seasons have been kind of jumbled together lately up here in northern Minnesota. We had spring-like weather in January, summery temps in early March, and now we’re back to almost freezing as Easter approaches. Don’t get me wrong, I despise heat. And when I say heat I’m talking about over ninety, never-stop-sweating-for-days heat. That is what we got five years ago when we got married. I remember that week like it was yesterday. 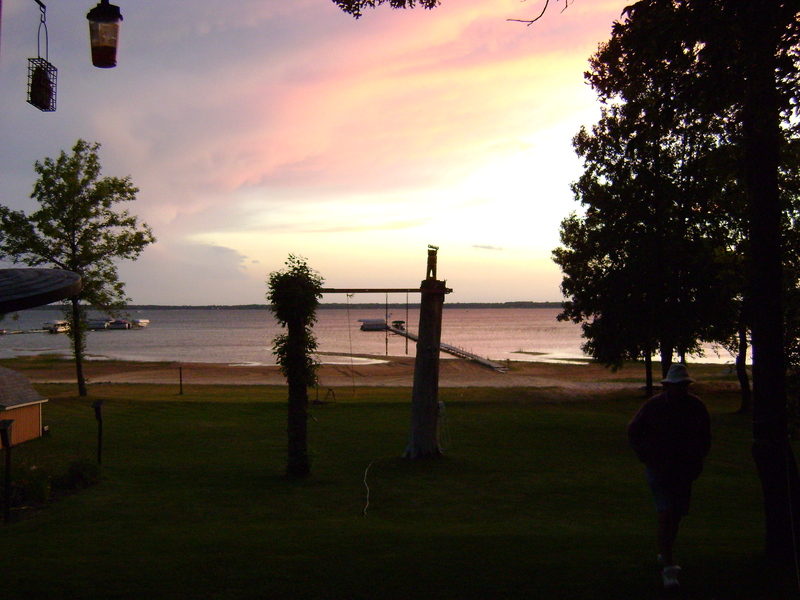 Mike and I were planning on a beautiful wedding at Breezy Point Resort on Pelican Lake in central MN. But as the date approached, the forecast made it clear we were in for a doozy! Thankfully we were not having a traditional wedding with formal attire and a large guest list. Since we had both been married before, we opted for a very laid-back ceremony with casual attire on the beach. Our small group of friends and family huddled under the big tree for shade as the temperature soared over a hundred degrees. I dug my bare feet into the coolness of the damp sand for some relief. My poor daughter was nine months pregnant and miserable; but she was a trooper! After the ceremony and a few pictures we rode off for a newlywed golf scramble on the beautiful golf course of Breezy Point Resort. They have two courses there, but I think we were on Whitebirch. With the weather as hot as it was, we kept the beverage cart girl quite busy! That was probably the craziest day of golf I’ve ever played. We had a large group and there was plenty of laughter as we went along. When we were done golfing it was a quick jaunt back to the large houses we had rented just off the course. Since Mike and I both love to cook we prepared the meal ourselves. The houses even had gas grills and nice patios that saved us from the direct sun and extreme heat. It was great to just hang out and celebrate with everyone in a very laid-back setting. Of course you have to have some music at a wedding. So, later that evening we wandered down to the resort’s watering hole for a little revelry with Elvis! Now how many people can say that on their wedding day they hung their ‘Just Married’ sign on a golf cart and danced the night away with The King? Five years later here I am, anticipating summer. Am I crazy? Maybe I should sit back and enjoy watching the tulips and daffodils pop up. Or maybe I should go play some golf and practice my putting. Either way, I really hope we get to go back to Breezy Point Resort soon. I miss Elvis. I don’t attend too many girls-getaways or trips. I guess I’m kind of a homebody and enjoy spending time with my family. However, when the manager of the AmericInn® in North Branch, MN called me about his Women Only Weekend, I was instantly intrigued. He knows that I fancy myself a bit of a crafty person, and this was a good chance to maybe sell some stuff. All of a sudden Holy Craft! Upcycling was born. Since that invitation, I have been feverishly sewing, crocheting, and crafting in my spare time. It is really something that I enjoy, I get to re-purpose some old stuff, and it keeps me from planting myself in front of the TV! One thing I’m looking forward to in particular is the potential relaxation. In reviewing the flier for the “WOW” event, I spotted manicures, pedicures, and massages. Massages…. Mmmm, massages. That is something that I could really use. Perhaps it’s the changing weather. Perhaps it’s the fact that I’m getting older. But somewhere along the way it happened, I’m sore. Not all the time, mind you, just frequently. The thought of a brief period of time in which stress and aches melt away sounds like it may be heaven. I don’t futz too much about my nails anymore. As previously mentioned in a blog post about becoming a nature girl, I don’t really have the need, time, or patience for manicures anymore. However, a good pedicure can be amazing on tired runners’ feet. I don’t worry so much about fancy polish; just make sure they’re soft and blister-free. I usually take care of this myself. But the thought of a relaxing pedi during a WOW affair can really get a girl’s motor running! We’ve stayed at the AmericInn® in North Branch a few times. It is a very nice hotel and they are usually kind enough to put us in a suite with a hot tub. Talk about relaxing! And how can you beat waking up to the smell of fresh coffee and waffles? The town of North Branch is very nice and the people are very welcoming. There’s a terrific little place on the main drag called the Olde Brick Inn with good, cheap food. It’s not fancy, but neither are we, so it is perfect. If you like it a little more upscale, The Oak Inn is almost across the street and also has great food, and still not stuffy—but they do have waitresses! There’s also plenty of quick food nearby incase I only have a minute to grab a bite. I do hope that there’s a little time left over for shopping. Just across I-35 is the North Branch Outlet Mall. The last time we stopped there I cleaned up at the Bali/Hanes and Nike stores! I don’t think I’ve ever gone there without shopping at the Kitchen Collection outlet, but my absolute favorite has got to be the Dress Barn. I know, it seems like such a bizarre name–Dress Barn—but I absolutely love their clothes and you cannot beat outlet pricing! All in all, I’m very excited for my Women Only Weekend. I have my Upcycling ready to go, have isolated my problem areas for the massage, and cannot wait to meet Rob the Mixologist for my fruity drink tasting. Helloooo North Branch! “Seriously, how many pairs of sneakers do you really need?” This was an actual comment from my husband, God love him. Doesn’t everyone have these mountains of little gems? 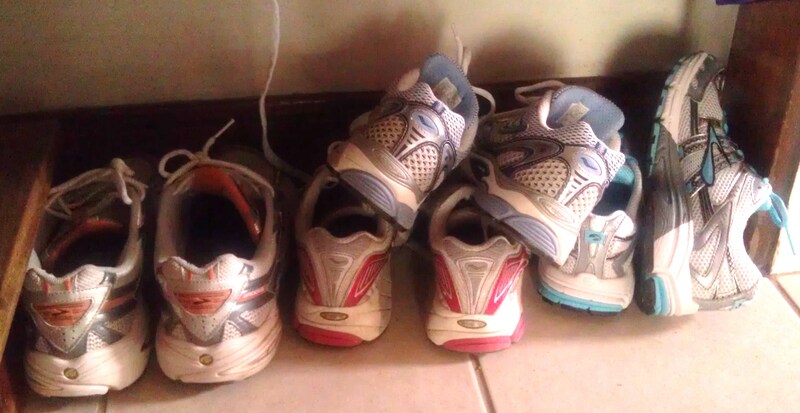 And in my house we run; which is why there are so many piles of sneakers. The shoes we wear for training and racing are usually good for about 300 miles or so. After that, they are no longer good for the original purpose, but they are still in good shape. I’m sure I’ve made my point in previous blogs, I’m cheap; so I’m certainly not going to throw them away! This led me to investigate shoe drives. In doing a little digging around the Runners World website, I came across the company Soles4Souls (http://www.soles4souls.org/). These guys are doing an awesome job at collecting and distributing donated shoes of all types, and that got me thinking. In June we will be running the Garry Bjorklund Half Marathon as part of Grandma’s Marathon weekend in Duluth. This is such a huge event in northern Minnesota, attracting tens of thousands of visitors and locals to the downtown area along Lake Superior. Perhaps this is the ideal time to execute our own shoe drive. I have fired off a quick email with a couple of questions to the folks at Soles4Souls. I love the idea that my cast-off kicks could be passed on to someone halfway around the globe. I usually keep a fairly strict rotation for sneakers: training, walk-abouts, and finally camping/beaters. Once a pair of shoes makes it to this last phase, I have a hard time deciding where it goes from there. Sometimes I pass them on to my daughter, but that means they’re possibly still in the house, and therefore back in “Shoe Mountain”. Once here, it’s easy for them to creep back into my rotation, only to cause confusion and back-ups in the program. Enter the donation. Think about tying your shoe drive in with another event in your community. Is there a running race or walk? Any type of large sporting activity? Maybe your city has a big festival or gathering for Memorial Day, Earth Day, July Fourth, Labor Day, etc. that will attract a lot of attendees. You could work with the organizers to piggy back on advertising. Just remember, if you go with Soles4Souls, you will need to pay for shipping the shoes if you’re not in close proximity to a drop-off location. This would be a great opportunity for a corporate sponsor. They suggest you plan on about a dollar per pair of shoes to cover shipping. I hope that I have inspired you to organize your own shoe drive. Don’t be afraid to think outside of the box. They collect all types of shoes, not just sneakers, so look to fashion shows/expos, too. It’s a great way to pay it forward, not to mention make room for new shoes! Because, like I tell my husband, you can never have too many shoes! I revealed in a previous post that I am cheap. Not frugal or cost-conscious, just plain old cheap. I was the same way when I worked in the hotel business. When we got new orders of sheets or towels in, my staff and I would try to find ways to reuse the old goods. Towels were pretty easy; you could never have too many rags. Sheets were a different story. The linen of the sheets didn’t make very good rags. Some were wearing out, some had stains, what were we going to do with them? Nowadays I find that we throw very little away. Thankfully my husband is a very patient man who understands my hoarding mentality when it comes to “projects”. It sometimes takes me a while to get to things, but I’m usually pretty good at finding reasons to hang on to things! I would love to share some ideas for upcycling your old castoffs. I hope that this will encourage you to upcycle some of your old leftovers. I used to feel bad throwing away clothing that was beyond the minimum standards for donating. Now I just buy more storage bins! And if you’re not a crafty person, the odds are that you won’t have to look very far to find someone who will gladly take those items off your hands. Happy upcycling! 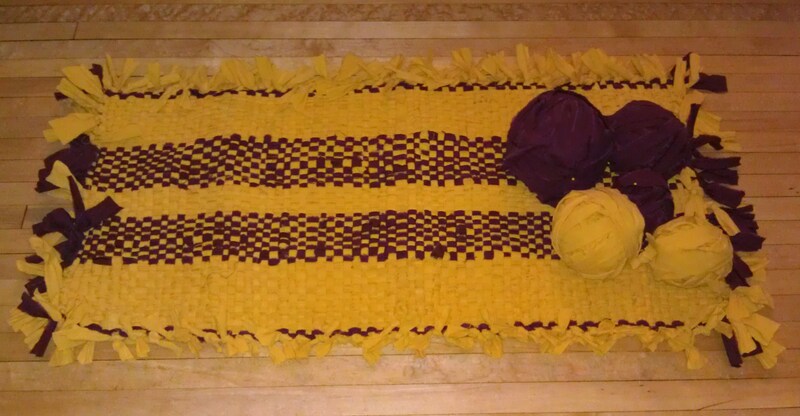 Rug made from two contrasting flat sheets. Plenty left for more! I love peppers. I am extremely cheap. a pepper isn’t going to break the bank. However, if you eat them like we do in our house, it can definitely add up. That’s why I’m planning my summer garden. That may sound impressive to some people. Really it’s not. I’m secretly lazy and hate the thought of weeding, crouching, and frankly getting dirty. That is why I am a huge fan of container gardening. It doesn’t have to be a major endeavor. You can do it with just a few containers, dirt, and seeds. And if you’re creative, you can use a whole variety of things for your containers—large terra cotta pots, oversized planters, window boxes, even an old basket or hamper. First think of what you would like to grow. Love carrots, tomatoes, or peppers? They grow great in containers. Buy a large enough pot or bucket so the roots can grow. Check the seed packets for how deep of a container you’ll need and how wide. You can start a bunch of seeds at the same time in the pot. Odds are, not all the seeds will sprout and you can thin the herd when they start growing. If you are planting “climbing” veggies, put a small lattice or dowels in the pot for them to climb up. Peas are one of my favorites. I use a big 20 gallon round bin, drilling drainage holes in the bottom. I fill it with dirt about ¾ full and place a small fence section from Menards. The peas love it! I hope you will be encouraged to go out and plant some veggies. It doesn’t take a lot of space, time, or money. 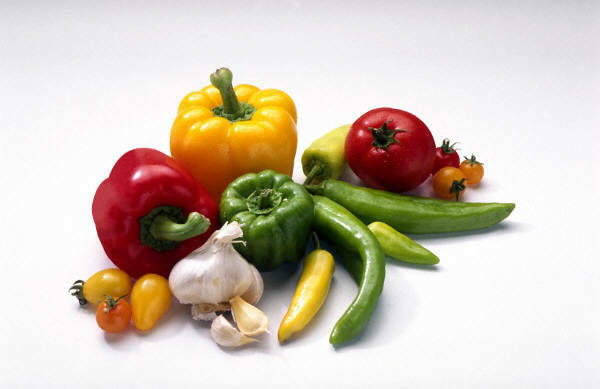 You can have FRESH vegetables this summer, and a nice stock in your freezer. And what neighbor can resist a couple of just-picked tomatoes? Happy gardening! Cut the avocado in half and remove the pit. Chop it up, but not too small of pieces or it will get mushy. Roll the lime on the counter, cut it in half, and squeeze the juice over the avocado. Stir it up so that the juice coats all pieces of the avocado, but be careful not to squish or mash it. Chop fine all of the remaining ingredients and put in the bowl. Stir all of the ingredients together and give it a taste. We put a little salt and fresh ground pepper in, but you may want to wait until just before serving to add this. It is better to make this a couple hours ahead so the flavors can marry. Serve with chips, tacos, nachos, or rolled with a little sour cream in a warmed flour tortilla. YUM! !